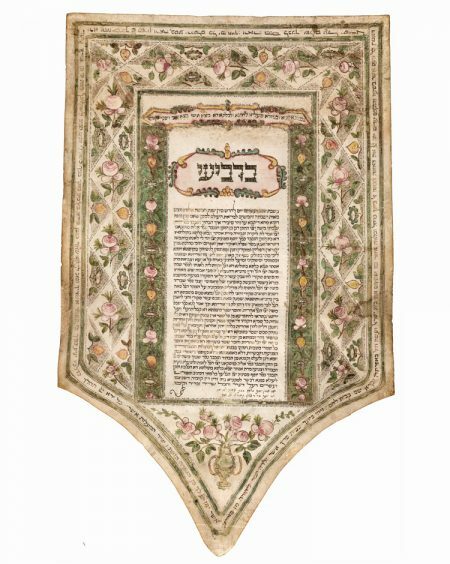 This ketubbah commemorates a wedding between two important families of the Roman ghetto, Toscano and Di Segni. The members of the former were leading bankers who had become the wealthi- est Jews in the ghetto in the seventeenth century. Their arrival from Florence in Tuscany is reflected in their name. In keeping with their exalted status, the ketubbot of the daughters of this family document exceptionally high dowries for this period. Although the wealth of the family members had declined by the time the present ketubbah was created, they continued to invest in the production of attractively decorated contracts. The sumptuous ketubbah of Rebecca Toscano, the bridegroom’s sister, which is preserved in the National Library, Jerusalem is noteworthy as well. The ornamentation of this contract reflects the golden age of ketubbah decoration in Rome. Rather than concentrating on visual motifs, the design focused on elaborate Hebrew calligraphy. The work of a skillful scribe, the many texts that fill the page are written in square Hebrew letters of varying sizes. The decorative frame is divided into inner and outer borders. Panels adorned with flowers on painted gold fields flank the sides of the text. In the outer frames, crisscrossed micrographic inscriptions form diamond-shaped spaces, each of which contains a large flower. The designs in the inner and outer frames are surrounded by minuscule, square Hebrew letters, presenting the entire four chapters of the book of Ruth. Micrography, the technique of utilizing minute Hebrew letters to form representational or geometric designs, is found in the earliest extant decorated Hebrew manuscripts of the ninth century. While in other eighteenth-century Roman ketubbot brief sections of the Five Scrolls were sometimes included, inscribing the entire text of one of them, as was done here, was uncommon. Perhaps the book of Ruth was selected because the wedding took place in the month of Sivan, when this book is read in the synagogue during the Shavuot holiday. Another reason may be related to its contents with the central wedding story of Ruth and Boaz, which is quoted on many ketubbot, including this one. Moreover, the scribe planned the micography of the book of Ruth so that the wedding section appears directly above the column of the ketubbah text. selected literature Davidovitch 1979, pl. 3.